Yesterday, we covered Core4418 low profile board based on Samsung S5P4418 quad core Cortex A9 processor, but that’s not the only product launched by FriendlyElec this week, as the company also introduced Smart6818, a Samsung S5P6818 CPU module following Smart4418 module design, and equipped with 1GB DDR3, and 8 to 32 GB eMMC flash. Just like other S5P boards from the company, Android, Lubuntu desktop, and Ubuntu Core based FriendlyCore images are provided. 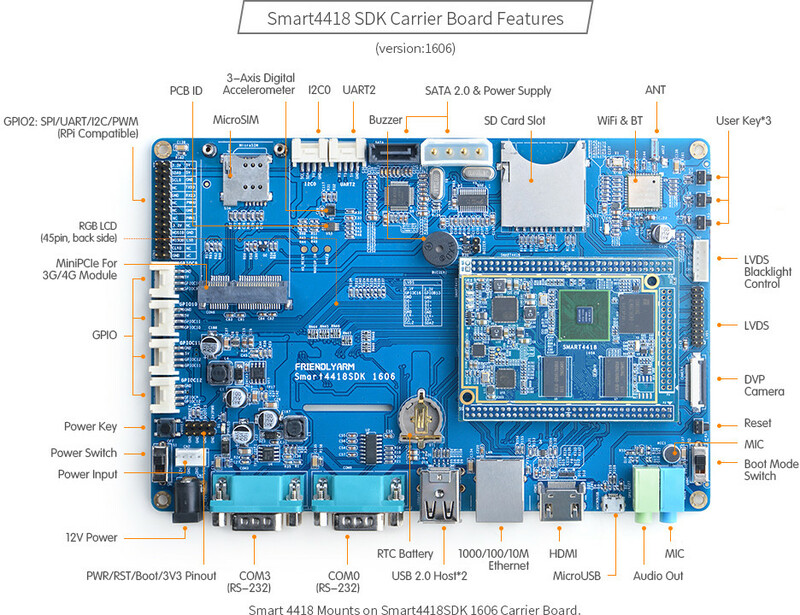 A photo of the development kit is shown, but there’s no Wiki entry yet, so we can check out Smart4418 Wiki and Smart4418 Basic Set’s listing to get a good idea of the features offered on the development kit since Smart4418 and Smart6818 should be pin-to-pin compatible. Smart6818 module is sold for $49.00 ($46.00 per unit for 50+ orders), while Smart4418 module goes for $45.00, and Smart4418 Basic Kit with carrier board and 8GB Smart4418 module for $99.00.Three optional modules can be added to the devkit order: a $89 4G mini PCIe module (ME909u), $19.99 CAM500B 5MP camera module, and/or $65 HD702 7″ capacitive touch HD LCD. Is that real sata or usb->jmicron sata ? http://wiki.friendlyarm.com/wiki/index.php/Smart4418SDK_Comparison — JMicron JM20329. Not the best choice (not UAS capable) but doesn’t matter due to being bottlenecked by single USB2 connection to the host. priceless .. what are these board designers thinking. Yes, S5P6818 modules have been around for at least 2 years, e.g. 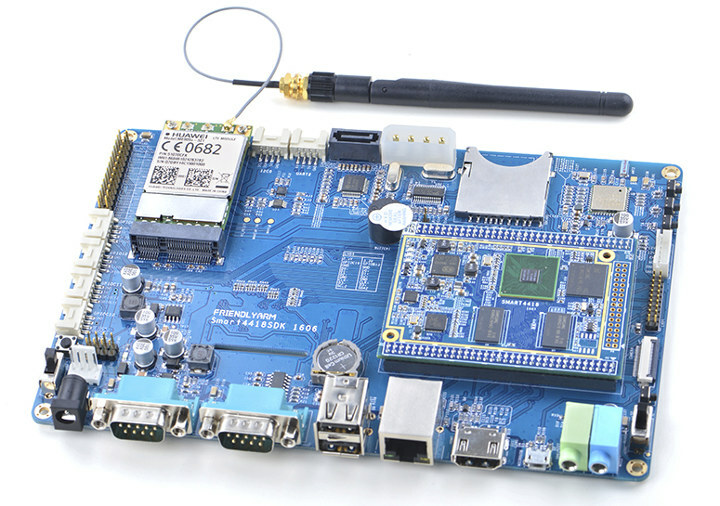 https://www.cnx-software.com/2016/07/13/smodule-sbc-x6818-development-kit-based-on-samsung-s5p6818-processor-includes-a-7-touchscreen/, but the Smart6818 module should be new as it’s shown in the “Latest” section on FriendlyElec’s website.